View cart “Self-Care Starter Kit” has been added to your cart. Is the idea of balance truth or myth? Most of us feel overwhelmed by the idea of work-life balance and the continuous juggling of personal and professional responsibilities. I mean, life can feel downright chaotic at times for all of us. But what we may not realize is that living in a constant state of over-functioning for long periods of time can really take a toll on our health. And I know there will be some people who disagree with me on this, but balance is an undeniable, universal truth. Whether we realize it or not, the pursuit of balance is happening all around us at every second. All living things are constantly exerting energy in pursuit of balance. Nature offers many examples of this, but let’s take a quick look at the human body. It’s part of our internal survival system, see? And when our bodies fail to maintain that momentum toward achieving balance, that’s when our health begins to decline. Since every living thing is in a constant state of flow, it’s perfection — not balance — that’s the myth. But I get it. It’s easy to get caught up in the fallacy that in order to experience the benefits of balance we must be in perfect balance. It’s what we’re taught. It’s what we hear ad nauseam from the media. And it becomes just one of the many unrealistic expectations we set for ourselves. Even so, while a perfect state of balance may be impossible to achieve as an absolute end point, we do feel better the closer we get to it. When we’re closer to center, we’re happier, more creative, and better able to deal with the chaos life sometimes brings our way. Perfect balance isn’t the objective at all. Feeling balanced simply requires us to invest our energy in the areas of our life that move us closer to center. That’s what makes us feel grounded and stable. And when we feel balanced, life gets easier. Problems appear simpler. We’re less likely to allow fear to guide our decisions. And we have more energy leftover to do more of the things we love. 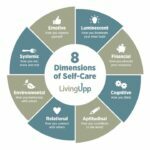 The same principle of balance applies to Living Upp’s 8-dimensional framework. When you invest your energy into each dimension sufficiently, you feel more balanced. And that’s where your power lies. Balanced people — those who are able to manage life’s complexities with ease — have more resources leftover to enjoy their lives. That’s because they live closer to center and less energy is required when the need for a course correction arises. Instead of living in a reactionary state, they experience more flow and ease. Instead of wasting precious energy on high-pressure problem-solving, they have the energy reserves to find creative solutions to their problems. Instead of constantly putting out fires, they’re able to see the bigger picture and make decisions from that place. I think that’s why so many people get hung up on the idea that life must be in complete harmony to be balanced. They get stuck in the belief that the end goal is perfection rather than simply a movement toward it. And since perfection isn’t real, they determine balance is a myth as well. But balance is an undeniable truth that is better experienced first-hand than described in words. It’s a “you know it when you feel it” kind of phenomenon. And because it’s subjective (what makes one person feel balanced may not be true for another) it can be difficult for us to wrap our brains around. That’s one of the reasons I felt compelled to publish The Self-Care Planner. When we try to separate our personal and professional goals, thinking it will bring us balance, we end up making our life more complicated. Having a single place to organize all of the pieces of my life has been a huge game-changer. Lifestyle design is a tool that can be used to help you experience more balance because it helps you understand your unique needs, priorities, preferences, and strengths. And until you understand who you are and how you want to experience your life, you’ll never know exactly how to structure your life to make it a reality. Ready to live with more flow and ease? The Lifestyle Design Studio offers unique tools and resources to help you stay focused on, and committed to, maintaining a movement toward balance. Join the Lifestyle Design Studio now. It’s the constant movement toward balance that’s the sweet spot. That’s when we feel our best. Because it’s our pursuit of balance that makes us feel alive. What has been your experience with balance? Is it a myth or truth for you? Leave a comment below or hop on over to our Living Upp Facebook page to join the discussion. Ready to do life differently? Living Upp is a participant in the Amazon Services LLC Associates Program, an affiliate advertising program designed to provide a means for sites to earn advertising fees by advertising and linking to Amazon.com. Pages on this website may include affiliate links to Amazon and its affiliate sites and the owner of this website will make a referral commission. This entry was posted in Self-Care News and tagged balance, perfection.